When you begin the home building process, the first and foremost thing to consider is, where are you going to build the home of your dreams? Many different factors go into selecting the right lot for your custom home build. 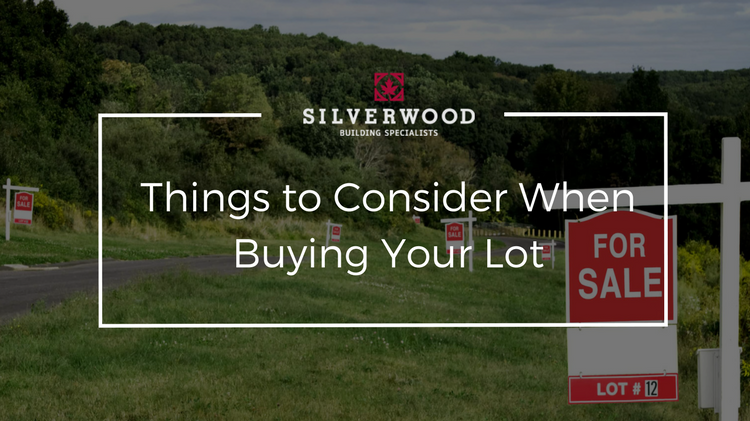 There isn’t a magical secret recipe or formula to get the perfect lot at the perfect price, but when considering the following things, you’ll be on the right track to finding the best lot for your future home. First and foremost, you need to decide where you want to live. Consider whether you want your new home to be closer to the city, or if you’d prefer to be further away from traffic and city congestion. Consider if you’d like to have your neighbors close, or if you’d prefer them at a distance. If you’re building a home with a young family in mind, considerations like the school district, traffic on nearby roads, and proximity to parks should be factored into your decision. The size of your land is another important piece to consider. If you’re someone who enjoys a large amount of acreage for various reasons you may want to consider further out of town. Different lot sizes bring different qualities. Larger lots that have more acreage come with more landscaping needs, while smaller lots do not. Although they do offer landscaping and maintenance convenience, smaller lots do require more carefully planned outdoor activities due to the limited space. Consider the shape of your lot too. Different shaped lots can come at different price points. A t-shaped lot at the end of cul-de-sacs, for example, will allow for cars coming down the end of the road to shine their headlights directly into your home. Also, irregular shaped lots can change your home placement in locations that you didn’t originally plan. For example, an engineer or builder may decide it to be necessary for your home to be placed hundreds of feet from your original spot to allow for proper drainage. The slope of your lot is also important to consider as well. Homes built on slopes will drain water differently than those on level ground. Also, when building a home, it may be a cool idea to consider adding a walkout basement from the bottom of the slope. That functionality comes at a relatively low price. However, homes on a slope typically require more gravel backfill at its foundation, or even more retaining walls. The soil that is underneath the ground is going to vary depending on the location of your lot. When the foundation is excavated, the type of soil underneath will have an impact on the final price you end up paying for the construction of your new home. Having a general idea of what is underneath the surface is important when you go to purchase your new lot. Amenities include things like natural gas, cable, internet, etc. For some people, these are important amenities to have in their home. For lots and homes that are far out of town, certain cable or internet providers may be out of their range and be unable to provide service. Additionally, some people may argue that having natural gas is more beneficial and easier to deal with versus filling a propane tank at your home. Again, that will vary person to person, but it’s something for yourself to consider. For many, the price is the determining factor when it comes to picking a lot to build their new home. All the above considerations play a factor in the final price for your new lot. Together they will be taken into consideration by the seller of the lot to put the final price together. Finding the right piece of land to build on, can be done. Making sure you don’t settle for just a cheap piece of land is important. Just because it’s cheaper doesn’t mean it’s better. There’s a reason why it’s cheaper. Just make sure that it’s for a good reason. The professionals at Silverwood Enterprises have been operating in the Traverse City area for over 35 years. That means for that over 35 years; we’ve been helping our clients with lot evaluations. If you have a lot in mind that you’d like to build your future home on, the professionals at Silverwood will evaluate that lot for you and give a non-biased opinion on how you should proceed. Contact our team today and see why we’ve been building dreams for the last 35 years.